Home runs. Stolen bases. Strikeouts. One of baseball’s greatest qualities is its records. And while the Bismarck Larks haven’t broke any on-field records quite yet, the team and its fans are on the verge of accomplishing something only a few teams in the sport have ever done. That’s right. 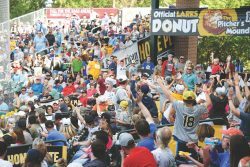 Larks fans have the chance to put Bismarck on the baseball map this summer. Last season, even after adding 300 new seats, the Larks sold out 30 of their 36 games. This season due to space constraints, no new seats will be added even though demand is still climbing. 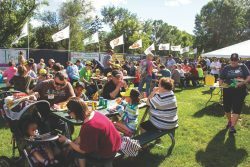 While the Bismarck Larks secured their first playoff spot last season and bring exciting, Division I college baseball players to our community, baseball wins and losses comes second to the FUN. 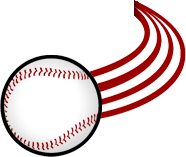 Last season, the Larks sold out 80% of their tickets before the season even started. With high renewal rates and an even further increase in demand, there’s a possibility seats won’t be available during the season. To ensure 36 sell outs and the most fun possible for fans, the Larks are pulling out all the stop. They’ve created a ticket package with the FAN FIRST in mind. It’s called the Scheels 7 Game Pack. Free All-You-Can Eat and Drink for 3 Innings. Food is always a huge cost when taking the family out for a fun night. The Larks decided to include it for FREE. Each game, enjoy hot dogs, (cheese)burgers, a special rotating entree, variety of flavored chips, two rotating sides, soda/water/Minute Maid Lemonade, and a cookie or fresh fruit or dessert free for three innings. Most Entertaining Dining Experience. New this year, you will receive a dining experience second to none. We’re talking a picnic area for dining, music, balloon artists, magicians, entertainment act interactions, and a few other surprises throughout the season. Best Seats to the Best Games. This season, ALL BOX SEATS will be sold exclusively to business season ticket holders and Scheels 7 Game Pack holders. Most of the best nights (fireworks, entertainment acts, celebrity appearances, etc.) had no tickets available for sale online or at the game last season. By purchasing this package in advance, you’re guaranteed the best seats and tickets to these nights. Pack holders receive first opportunity on where they want to sit in the ballpark on a first come, first serve basis. Flexibility. This perk is a fan favorite. The Larks know your schedule in the summer can be hectic, cue their No Ticket Goes Wasted Policy. Can’t make a game in your package? No problem. Stop in their front office or call before the game and swap out for a different one, absolutely free (based on availability). Guaranteed Giveaways. Pack holders are the only fans that receive our 5 coolest giveaway items of the year. The Larks can’t share all of the new gifts yet, but they do know you’re going to love the first EVER Larks yellow home jersey. The boys of summer will be rocking retro yellow uniforms at home next summer, and YOU will have the same jersey in your package. Clark the Lark Kids Club. Have children under 12? Awesome! They’ll automatically be signed up for our Clark the Lark Kids Club, free of charge. This gets them additional swag, access to VIP events with the players, discounts on youth baseball camps, and more. Highly Affordable. The best part to all of this – the price. A Scheels 7 Pack Bleacher Plan starts at only $16/ticket ($112 total). You can upgrade to box seats which include a back, arm rest, and cup holder for only $4 additional per ticket ($140 total). Need flexible payment terms? No problem. All the Larks need to reserve your package is 25% down, and the rest is paid when you choose your plan or can be broken into 3 easy monthly payments. The only (good) problem with this package is that 70% of our pack holders from 2018 have already renewed their seats for 2019. The Larks currently only have 500 new packs available, and once they’re gone, they’re gone. Be a part of history and give the gift of SELL OUTS this Christmas! Reserve your Scheels 7 Game Packs today by clicking here or by calling 701-557-7600.